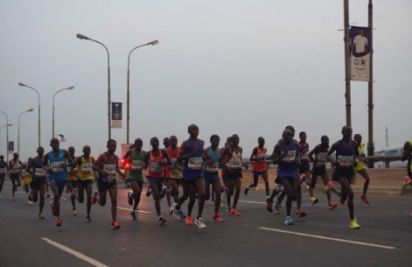 Last week, the 2019 Lagos City Marathon took place, and among the participants was a special breed of people who run marathons as a hobby and have raced in several parts of the world, with some of them even stretching the limits by running utramarathons like the Comrades in South Africa, which is 89km! They are called the Road Warriors, and according to the Chairman of the Club, Chukwuka Emuwa, the club was formed in 2012, and comprises almost a hundred professionals who have run about 500 marathons between them in cities like Boston, New York, London, Paris, Rome, South Africa, Lagos, Ife and others too numerous to mention. “There is no rational reason”, he said. “It’s one of those irrational things you do; maybe just say it’s on a bucket list. Life is short, why not? It’s an experience; what’s the worst that could happen? For Gbemi Abudu who sells private jets for a living, and has participated in every edition of the Lagos Marathon as well as the Paris Marathon, joining the Road Warriors is one of the best decisions she has made. She is also planning to run in San Francisco in May, and then the Tokyo Marathon next January. Affiong Williams runs her own company and as a fitness enthusiast who had gotten bored of the gym, she decided to stretch her limits by engaging in the marathon, which has taken her to different cities such as New York, Berlin, Paris, Amsterdam, Soweto, Johannesburg, Ife and of course Lagos. She also plans to do the Comrades (89km) soon. The Road Warriors faced a tricky situation this past weekend as the Lagos City Marathon was to hold on Saturday, February 2nd, while the Ife Marathon in Osun State was to take place the following day, with about 17 members penciled to run both races. “So I was the crazy one who actually suggested that we do both Lagos and Ife in the first place; they call them back-to-back. When we found out it was one race after the other, we thought ‘Why not? Let’s try it, it’s just another challenge’, and then people caught the bug”, he said. Gbenga Showole, an Engineer based in the US, actually flew into Nigeria just to compete in both the Lagos and Ife Marathons. For him, it is all about supporting your own. The Lagos Marathon was his 36th marathon! He has also raced in New York, Beijing, the Two Oceans, Washington DC, Detroit, Cincinnati, Dallas, and Philadelphia, and has done the Comrades three times! “I didn’t think much about doing both the Lagos and Ife Marathons, because if I did, common sense would prevail. A lot of people wanted to do the Ife Marathon but it just happened that they both came up on the same weekend, and we’ve never not run the Lagos Marathon so what do we do? And then some genius said maybe we can run both. I thought, ‘That doesn’t make any sense’. But somehow we decided that was the sensible thing to do”, she said. Femi Sholebo who runs an infrastructure power company in Port Harcourt, also raced in the Lagos and Ife Marathons and has been a part of Road Warriors for about five years. He’s participated in nearly 20 marathons including Paris, Madrid, Cape Town, London, Chicago, New York, Dubai, Kigali, Lagos, Ife, Vienna and Berlin. It was an interesting twist for South African couple – Anthony and Berene Yankovich-Besan, who are also members of the club. While Anthony opted for the Lagos Marathon, his wife Berene settled for the Ife Marathon. As far as Adedayo Adegoke, a Yoga Teacher and Oil and Gas Entrepreneur is concerned, running two marathons within 24 hours is not a tall order. Adegoke, who has run marathons in Amsterdam, Berlin, South Africa, Miami, New York, Athens, and Lagos, says it is all about challenging oneself. It’s not surprising that he emerged the third fastest male runner at the Ife Marathon barely 24 hours after racing in Lagos! Verheijen, who was initially supposed to run in both the Lagos and Ife Marathons, had to pull out of the latter after being injured while participating at the Lagos Marathon, underlining the fact that running marathons is not the easiest of hobbies. However, he vowed to bounce back stronger at the Lagos Marathon next year: “This is unfinished business: I’ll be back next year”, he said.